Servoy Migration Service - by .com Solutions Inc.
FmPro Migrator Platinum Edition 7.47 - Adds Support for Servoy 7 File Format. Note: This feature is not currently compatible with the new FileMaker 12 file format. Included with FmPro Migrator Platinum Edition, keeps your FileMaker Pro, Microsoft Access, Visual FoxPro to Servoy migration project affordable. 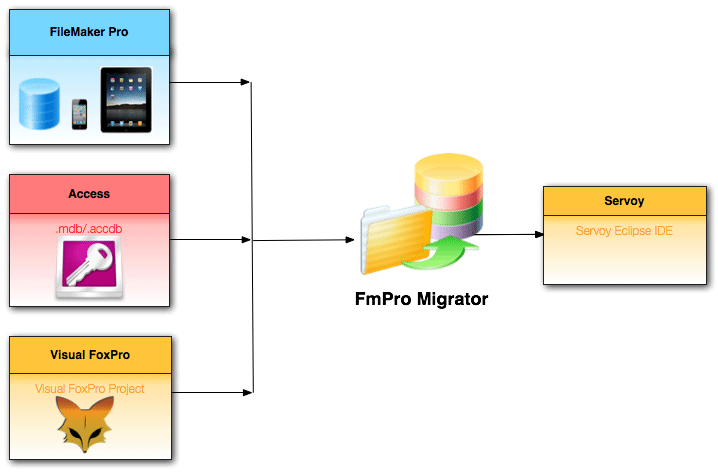 Process your files locally, using FmPro Migrator Platinum Edition. 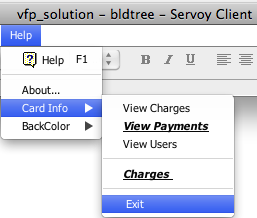 Automated conversion of Layouts/ Forms/Reports to Servoy Eclipse Forms. Global fields are added to the globals.js file. Database relationships are added to the Servoy relations file. Custom Value Lists are added to Servoy ValueLists. Layout/Form/Report embedded images are added to each generated Servoy Form. Converts Tab Controls and PageFrames into Servoy TabPanels including embedded objects and background color. Saves many hours of manual work converting each Layout/Form. The Servoy Migration Service built into FmPro Migrator Platinum Edition provides an automated conversion feature for FileMaker Pro, Microsoft Access and Visual FoxPro projects into Servoy Eclipse project files. 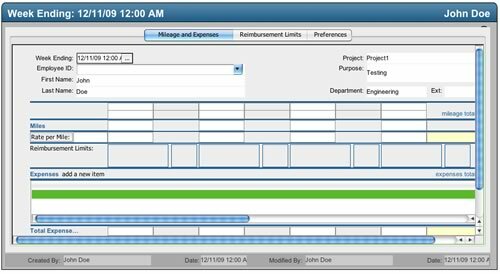 This service includes the conversion of layouts/forms/reports, scripts, relationships, and value lists within a predefined budget. This service leverages the automated layout and relationship importing features of FmPro Migrator Platinum Edition. The Servoy Migration Service License key is included with FmPro Migrator Platinum Edition. Save Time, Get Up and Running Quickly - It can be a tedious and time consuming process to manually re-create each FileMaker Pro layout object into any other development environment. Rather than spending days or even weeks of valuable time manually converting hundreds of layouts/forms/reports, Servoy developers can utilize the Servoy Migration Service as an economical alternative. FmPro Migrator Platinum Edition typically processes each layout within less than 1 second - much faster than you could perform the task manually! ToolTips Conversion - Object tooltips from form and report objects are converted into Servoy tooltips for fields, buttons and imbedded form image objects. Each database relationship imported by FmPro Migrator is converted into two Servoy Eclipse relationships. Both forward and reverse relationships are created within the Servoy Eclipse development environment, to operate in the same manner as the original relationship. Global fields within FileMaker Pro tables are converted into Servoy Eclipse Global variables within the globals.js file. The Global Fields conversion process relies on FmPro Migrator's ability to gather accurate table definition info from the original FileMaker Pro database file. The most accurate method for copying the table definition info is via the clipboard, which is a feature only available when using FileMaker Pro Advanced with FmPro Migrator. FileMaker stored and unstored calculation field calculations are converted into Servoy datasource calculations. 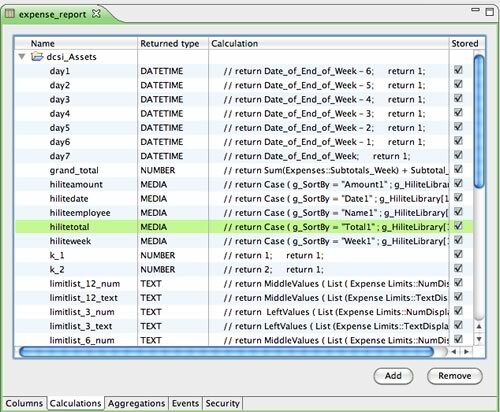 Unstored calculation fields are added to the Drop SQL Columns.sql report. By dropping these database columns from the SQL database, the columns become unstored calculation fields in Servoy. The FileMaker field calculations are converted into commented datasource calculation functions in order to serve as the starting point for further development. FileMaker Summary fields are converted into Servoy aggregations. Summary fields are also added to the Drop SQL Columns.sql report so that the columns will not appear within the SQL database. FileMaker merge fields are converted into Servoy merge fields having the same functionality as the original. The FileMaker merge field markers are converted into Servoy merge field markers and the data provider name is changed if needed. 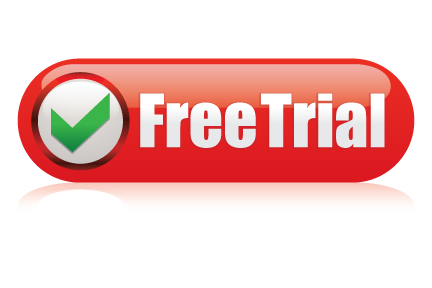 Data provider names are prefixed with the required relationship name if the fields are located in a related table, otherwise the converted SQL compliant table name is directly used as the dataProvider. Custom Value Lists are read or synthesized from the original database forms/reports and then added to the Servoy Eclipse ValueLists. Note: Dynamic Value List names are also added to the list of ValueLists, but the definition of each dynamic Value List will need to be updated manually to the project. Embedded layout graphic images are saved into the medias folder within the Servoy project and are also placed onto the Servoy Eclipse form. Only unique copies of images are stored within the medias folder, in order to prevent wasting space due to duplicate images. This means that if an image such as a company logo is used on 100 different layouts, only one single copy of that graphic will be saved, as all of the other 99 copies are duplicates of the original image. Tab Controls and PageFrames are converted into Servoy Tab Panels, including all embedded objects. Each Tab Panel is created as a separate Servoy subForm referenced by the Tab Panel control on the parent form. Embedded Tab Controls are migrated as well as the background color of each Tab Panel. 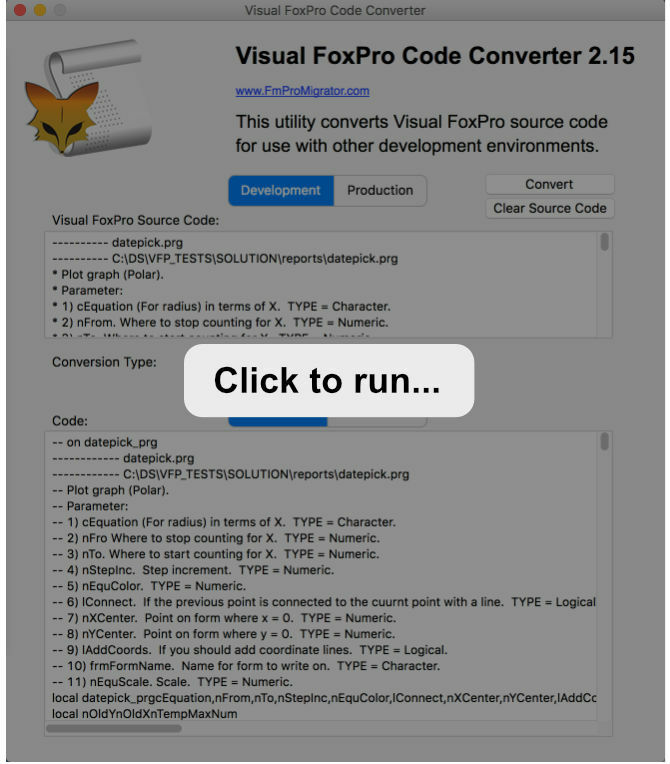 You can paste in your own FoxPro menu code into the revLet displayed below and instantly see the results. Due to the complexity associated with any database migration project, it is recommended that a small test project be completed prior to starting the full conversion project. By default, FmPro Migrator Platinum Edition processes FmPro to Servoy migration projects in demo mode without a license key. In Demo mode, FmPro Migrator Platinum Edition will process 5 layouts and 5 scripts. FmPro Migrator Platinum Edition - FmPro Migrator Platinum Edition is used for capturing the structure info from the FileMaker Pro database file and generating the Servoy Eclipse project files. FmPro Migrator Platinum Edition utilizes the DDR XML file generated by FileMaker Pro Advanced, along with AppleScript(MacOSX) or a compiled WinAutomation (Windows) job file [provided at no cost] in order to automate the capturing of Tables/Fields, Layouts, Relationships and Scripts. This import process follows the Table Consolidation Process steps, documented in the PDF file on the support page. Once the info has been captured by FmPro Migrator Platinum Edition, click the Servoy Migration Service button on the GUI tab. Complete instructions for the Servoy Migration Service are included a detailed PDF file. In demo mode, FmPro Migrator Platinum Edition will convert 5 layouts and 5 scripts into a Servoy Eclipse project. Buying a license key for FmPro Migrator Platinum Edition provides full-featured migration of the quantity of layouts ordered. This license key enables the processing of the specified quantity of layouts for an unlimited number of FileMaker Pro database files for the duration of the license key. FmPro Migrator Platinum Edition may also be used by the Servoy developer to perform the conversion of the FileMaker Pro database tables and data into one of the supported SQL database servers. FileMaker Pro Advanced 8.5+ - FileMaker Pro Advanced is used for creating a DDR XML export file providing the structure of the FileMaker Pro database file. This file is used for importing the relationships and layout display order info associated with the layouts. AppleScript(MacOSX)/WinAutomation(Windows) Software - FmPro Migrator Platinum Edition utilizes one of these two utilities to drive the FileMaker Pro user interface to automate the capturing of layouts from via the clipboard from FileMaker Pro. Servoy Eclipse 4.1+ - The version of Servoy Eclipse required must be at least version 4.1, in order to support the reading of project files generated by FmPro Migrator Platinum Edition. 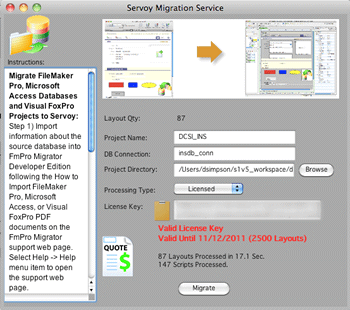 The Servoy Migration Service utilizes FmPro Migrator Platinum Edition along with the other software listed here in order to automate the capturing of layouts, relationships, value list names and scripts from the FileMaker Pro database file. Once the information has been captured, it is stored within FmPro Migrator's MigrationProcess.db3 embedded database file, saved to the output directory. This file serves as the source of info for the FmPro to Servoy Migration process. Layout Part Objects NOFIX - Info not available in DDR XML - A form body part is automatically created for each Servoy Form.